The Philly Food Feed: Is Ethanol Really the Answer? Is Ethanol Really the Answer? 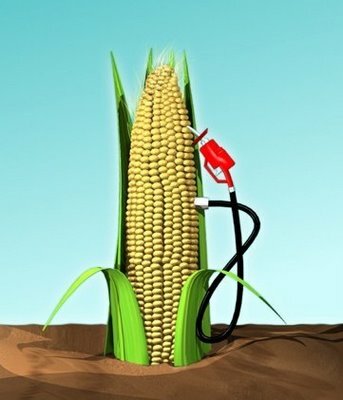 "When Congress in 2007 required a huge increase in ethanol use — to as much as 36 billion gallons a year by 2022 — it also required that ethanol — whether from corn or cellulosic crops like switch grass or wood chips — have less of a "life cycle" impact on global warming than does gasoline. It set the threshold at 20 percent climate-pollution improvement for corn ethanol and 60 percent for cellulosic ethanol, although ethanol made from facilities already operating would be exempt." "...when the ethanol industry took off in the United States, so did the price of its main raw material — corn. So farmers in places like Brazil planted corn on their pasture lands to cash in, but they still needed land to graze their animals on..."Where's Brazil going to get more pasture?" Bruce Babcock from Iowa State University asked at a House agriculture subcommittee hearing on Thursday. "Well, by converting Amazon forest and savannah. Thus the argument goes, any increase in Brazilian cropland leads to deforestation and a loss of savannah." And what does deforestation mean? More CO2 in the atmosphere - both immediate release from the burning of the forest as well as the long term effects of the loss of natural carbon sinks. The bio-fuel industry of course is downplaying these effects and wants the EPA to reconsider using them in their "lifestyle impact". Regardless, the fact that the use of corn for ethanol directly causes the price of food to go up (pretty much everything produced through the Industrial Food Chain uses corn). Considering the actual environmental impact and the impact on the consumer, it appears like this win-win is taking a turn for the corny. Perhaps concentrating more on the conservation and innovation side of environmentalism rather than working toward a new unsastainable energy are more viable options than using corn in our tanks. One idea involves the burning of biomass for electricity as opposed to using the liquid fuel for ethanol. I really hope the EPA stands its ground - perhaps if the environmental standards for ethanol are too rigid, industry will be forced to look for more efficient ways to power our automobiles.